Part # Cable Dia Pulley Dia. 3.18 mm 1 1/4 in. Tiny 3/64in. sheaves and shackles are used for miniatures and hidden small rigging. Pulleys in our 3/64in. sheaves turn on a shielded precision ball bearing. 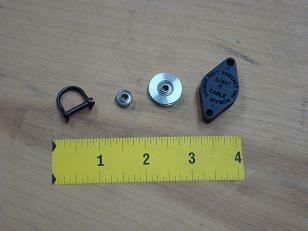 L to R: shackle, shielded ball bearing, pulley, complete sheave. Often used for laying out big cable rigs.